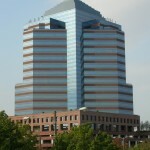 Prestigious 15-story Class A tower located in the center of Downtown Durham. In addition to outstanding views of the Bull City, the interior lobby features a magnificent 3-story atrium. Lobby with polished red granite floors and cherry paneled walls with stainless steel accents. Convenient access to I-40, I-85, NC15-501 and NC 147. 15 minutes to RDU Airport; 10 minutes to RTP.